This Ceviche Style Grilled Fish tastes amazing and is a favorite summer treat, especially paired with a Mango Couscous dish on the side. As you know, fish can get pretty expensive. 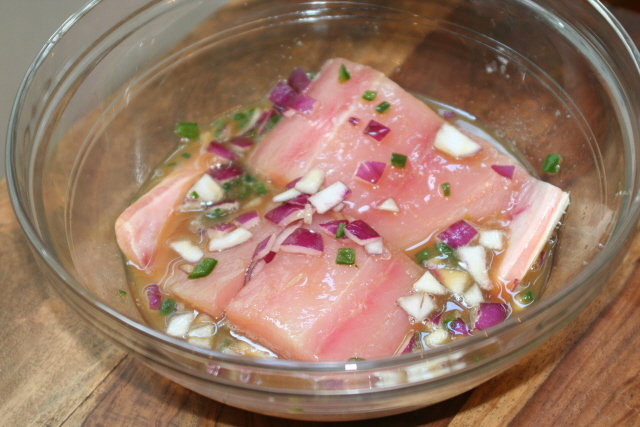 We used Mahi Mahi fish for ceviche style marinating and grilling in this recipe because it was on sale. I recommend using whatever firm white fish is in season and on sale. That’s a great way to cut down on the cost of fish. Ceviche style produces a great, light, fresh summertime favorite of mine. It’s always a treat when we have it. I thought the Easy Couscous Recipe with Mango HERE was incredible on its own, but then I tried it with this ceviche recipe. Fish never tasted so good! Ooooooh…it was amazing. If you have someone in your family who doesn’t typically like fish, I PROMISE they will like this recipe. Rub the fillets with kosher or natural salt and set aside. Mix together the onion, lime juice, orange juice, jalapeno, and sugar. Once sugar is dissolved, add the fillets. When you are ready to grill, pat the fillets dry with paper towels, use olive oil to lightly coat. Transfer marinade to saucepan and heat until it is reduced to about ¾ of a cup. After grilling fish (about 3-4 minutes on each side), serve with a covering of sauce and top with cilantro. 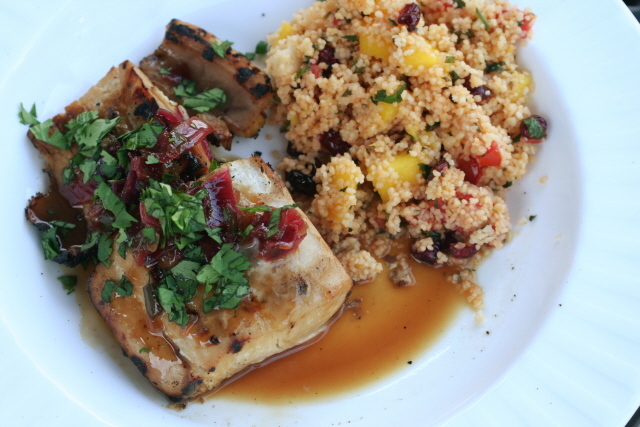 I made both the Grilled Mahi-Mahi fish recipe and the Mango Couscous and they were both outstanding!!! This was one of the best easy meals I’ve ever cooked. I went to two different stores and couldn’t find Mahi-Mahi so I substitued Chilean Sea Bass and marinated it for 24 hours and it was to die for. I will try making this again the next time a run across Mahi-Mahi.